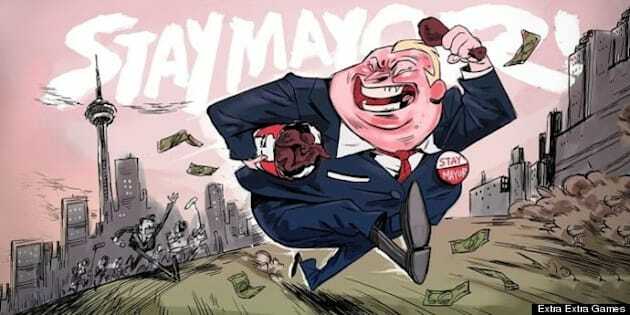 TORONTO - A mobile game for Google Android devices is lampooning the controversy surrounding an alleged video appearing to show Toronto Mayor Rob Ford smoking crack cocaine. In "Stay Mayor! ", by Toronto based app developer Extra! Extra! Games, the player controls a cartoon mayor being pursued by a pack of "bloodthirsty" reporters and cameramen. The player's mission is to collect $201,255 to buy the alleged video before the U.S. website Gawker can. In May, Gawker posted a campaign on the crowdfunding website Indiegogo seeking $200,000 in donations to buy the alleged a video. The money was raised but the website has so far been unable to obtain it. Gawker editor John Cook and two reporters at the Toronto Star said they viewed the video. Ford has said he does not smoke crack and the video does not exist. "Stay Mayor!" players must dodge crack pipes littered on the ground while being chased by the media and will lose a life if they're stopped for a scrum. But they also have access to footballs to hurl at the pesky reporters. "Stay Mayor!" is a free download via the Google Play marketplace.